Nowadays most people rely on their phones so much that it’s basically become a part of our lifestyle. They used to be just a device which can be used to talk and communicate verbally. Now they are much more than that. Telephones or mobile phones can now be used to acquire recorded messages when you are not able to take the call, for one reason or another. These recorded messages are called voicemail and they can be very beneficial to you, especially if you’re one who relies on communication for your business. 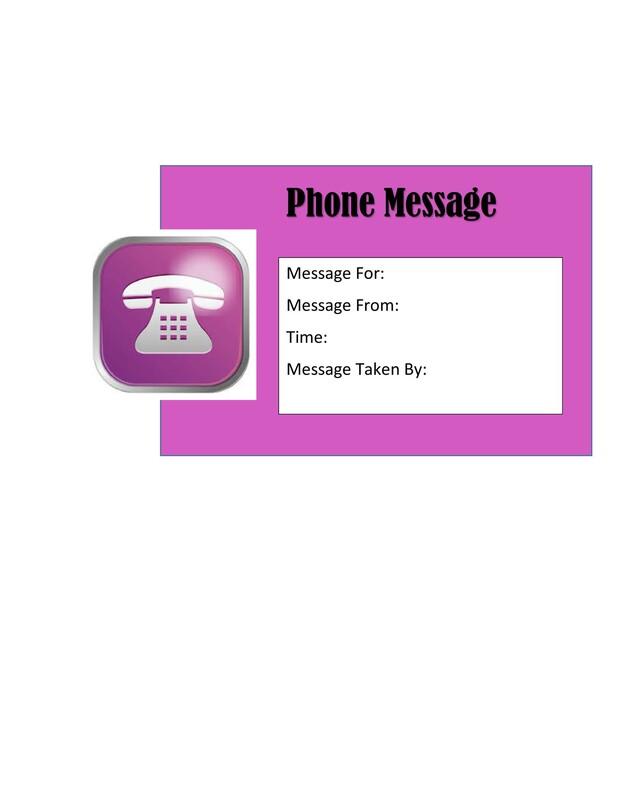 However, if you’re the kind of person who values all kinds of phone messages, then you can also look into using phone message templates in your business. 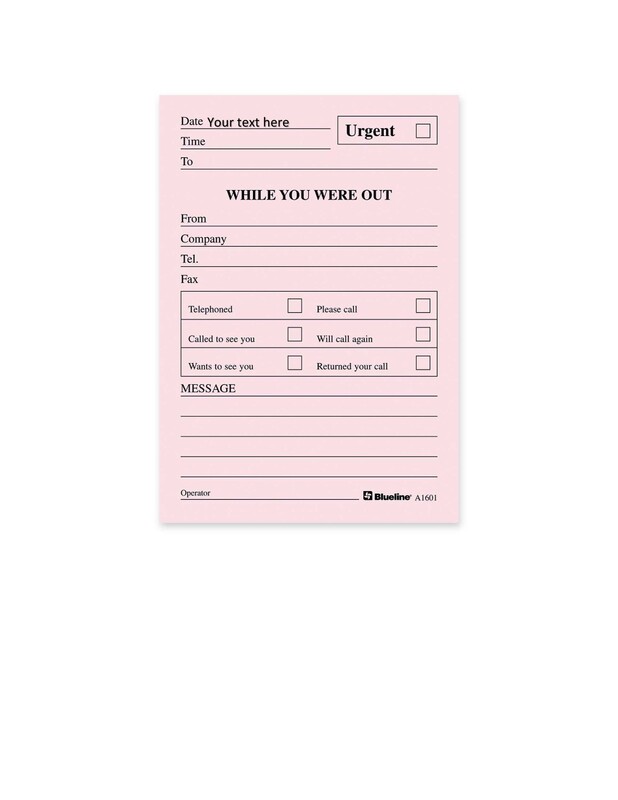 These are especially useful for messages or phone calls which come on the phones at work and you are not around. 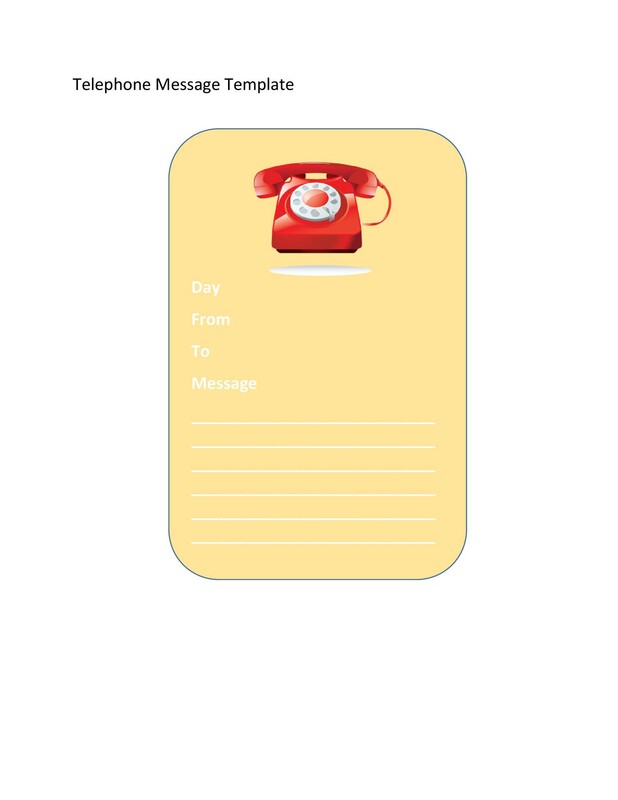 Making use of these templates would allow you to read through messages which are written down by the receiver of the call in the office. 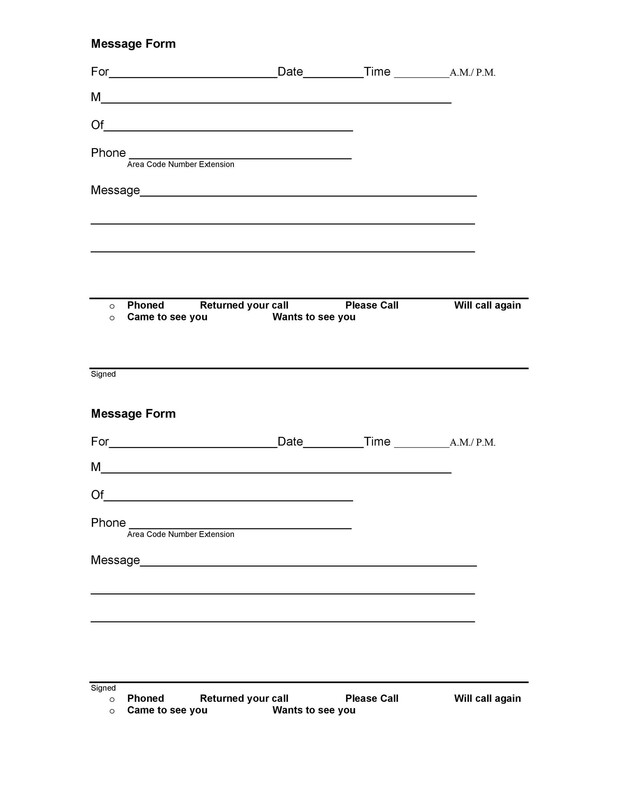 Aside from that, having these templates would mean that you have a record of all the calls that have come into your office, whether they are for you or someone else. 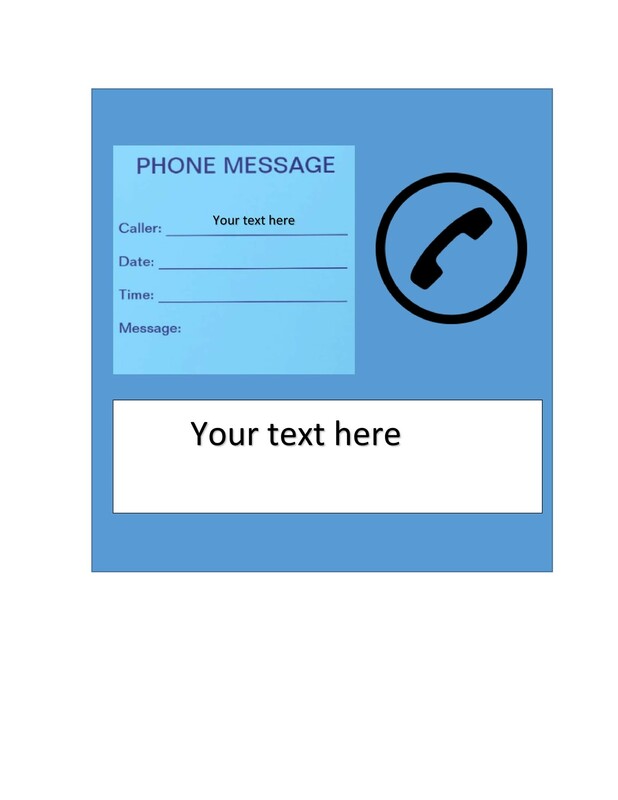 Taking phone messages and making use of a proper template is also essential for you to be able to keep in touch with your clients and customers. 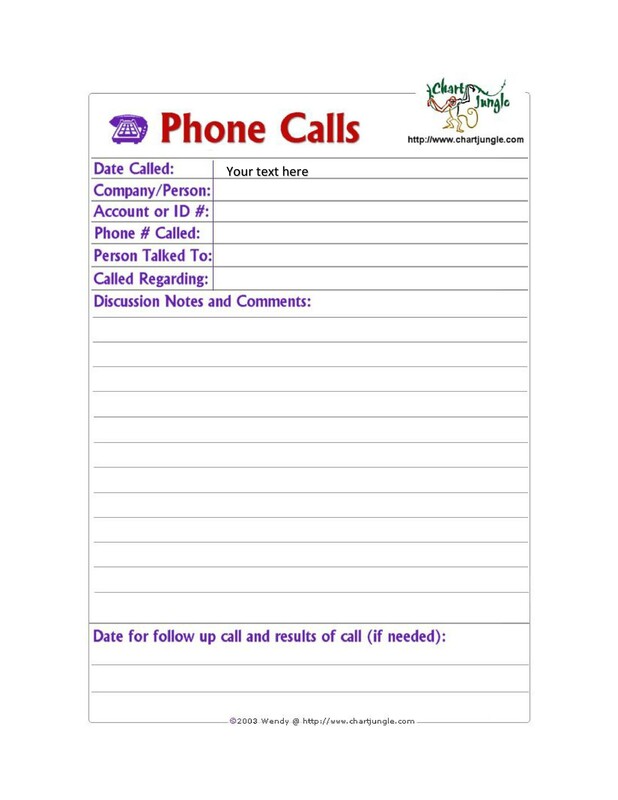 A template which can be used to note and record the details of phone messages is important and very easy to make. 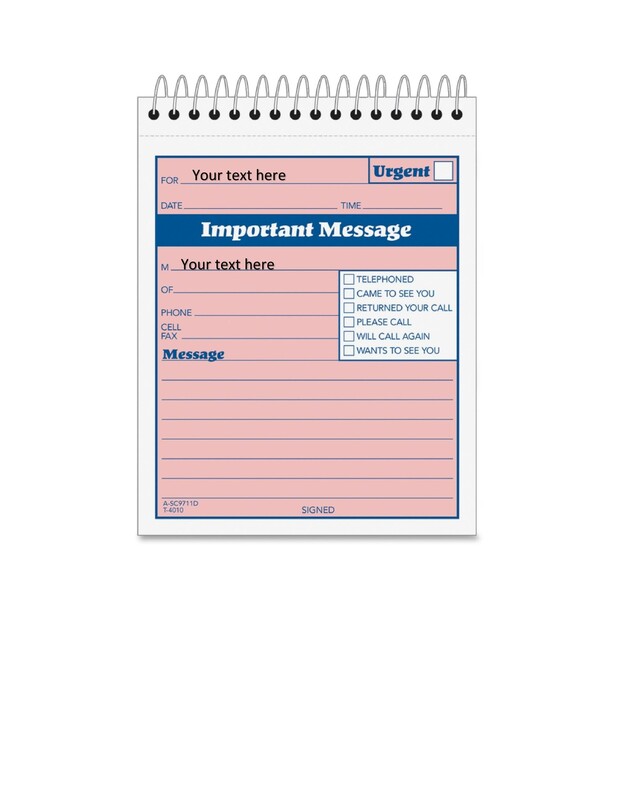 Making use of such a template in the office would make your phone and calling procedures in the office standard and efficient. Having a solid telephone communication procedure will definitely strengthen your business. It will give your employees the right information on how to deal with communicating with clients and customers. Not only that, bad phone etiquette might actually cost your business, which is a big no-no in the current competitive business environment. 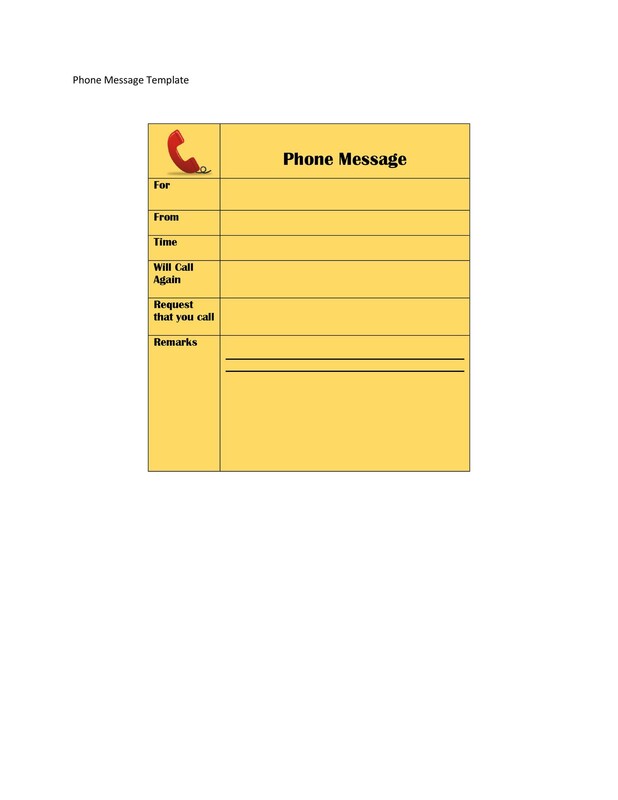 Once a template has been filled up by the employee, it should immediately be placed on the desk or message box of the person the call was for. Either that or the message can be given directly to the person once he/she returns to the office. When the call is urgent, the person who received the call may have to contact the person the call was for, depending on the procedures set by the organization. However, the most important thing to remember is that the message which was written on the template needs to be passed on to the right person as soon as possible. 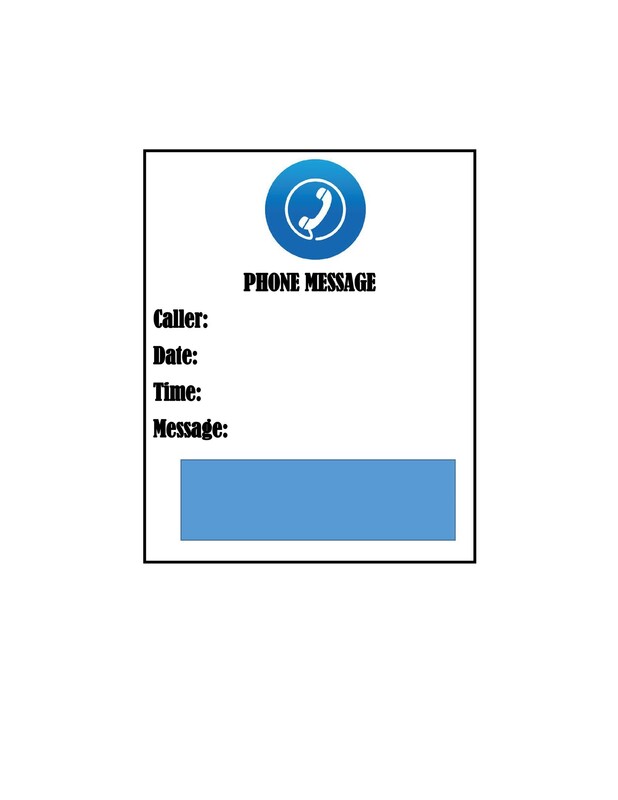 If you’re looking for a way to make your business communication a lot more productive and efficient, you can start making use of phone message templates. 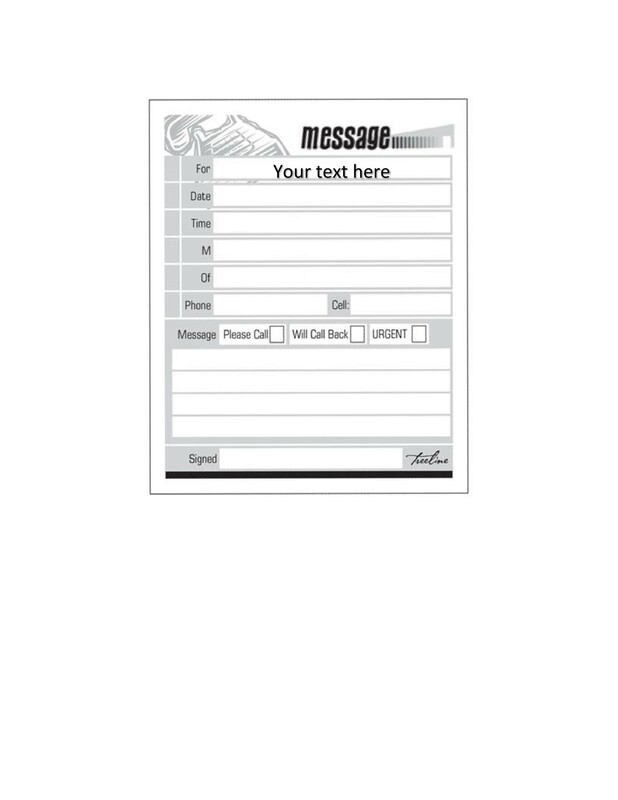 When you make use of these, you would be able to keep track of all the phone messages which come in and you can also record important information about your clients and customers. 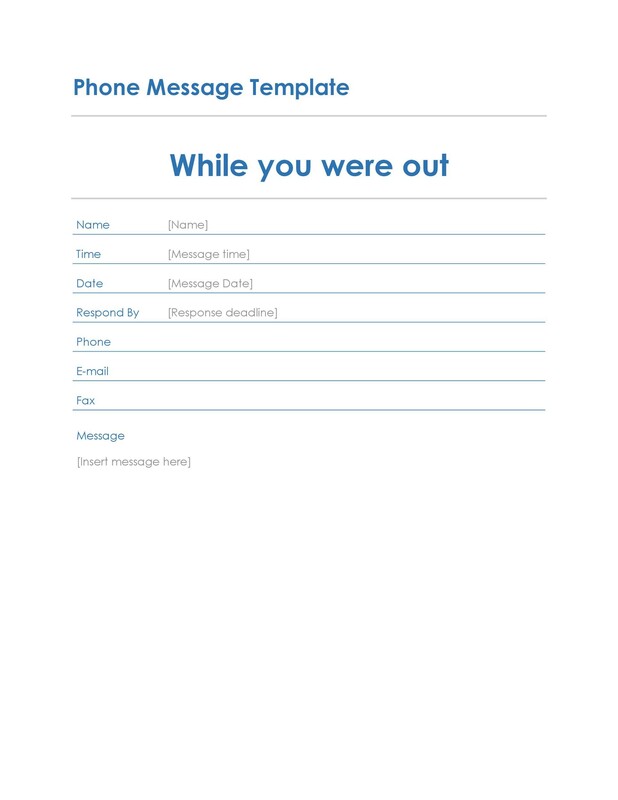 This template can be a very useful tool for businesses and organizations especially if it is created and used well. When you require your employees to make a record of each and every call, it would allow you to keep track of all the phone calls which come into your organization. 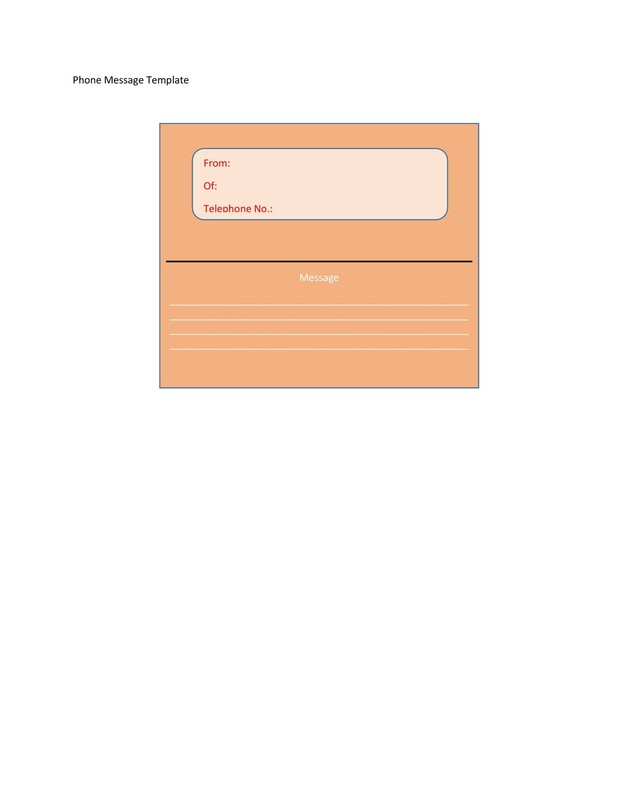 If you made your template well, it would contain crucial data which you can use for future transactions. 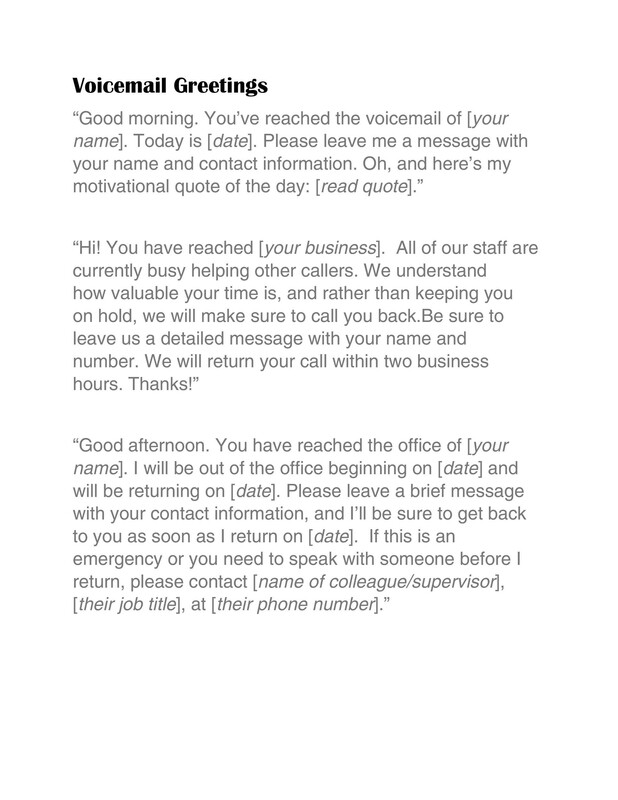 When you require your employees to take messages for people who are not available, then the messages can effectively be relayed to the person concerned. This is important and can be very beneficial so that communication is kept open no matter what the circumstances are. These kinds of templates can be used for any kind of purpose, they are very versatile. All you would need to do is creating a template then spread the instructions on how they are to be used. They can be used for effective communication and to ensure that nothing important is missed. 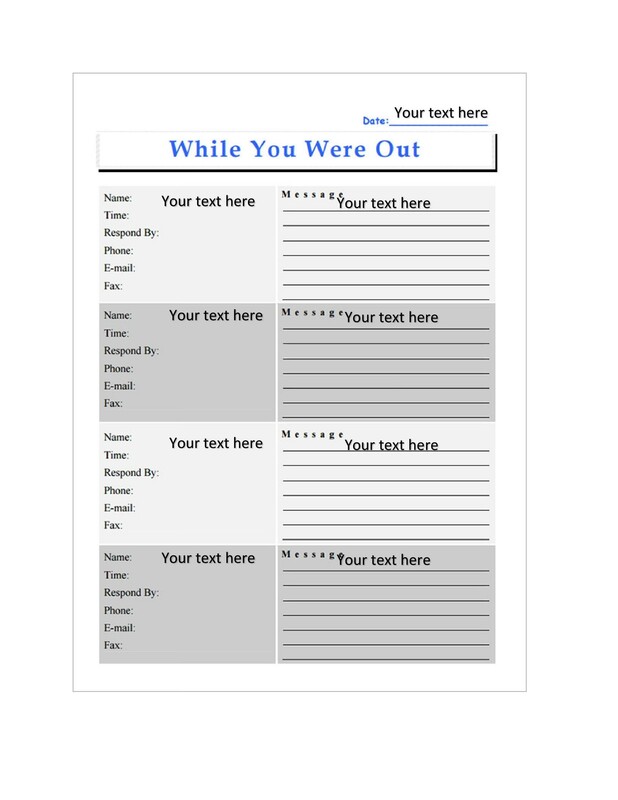 As you can see, these templates are really important, no matter how simple they are. 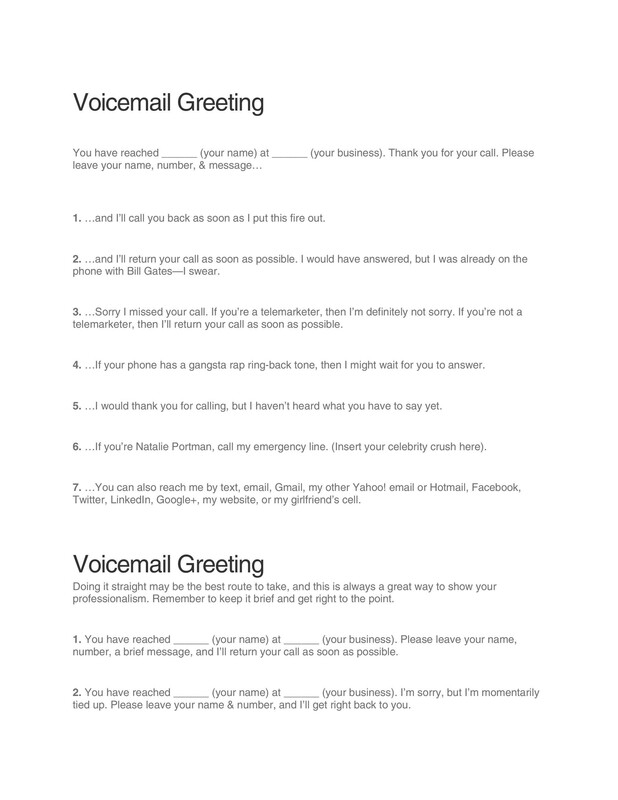 Before moving on to learning about voicemail message templates, let’s learn some tips to effectively take phone messages. 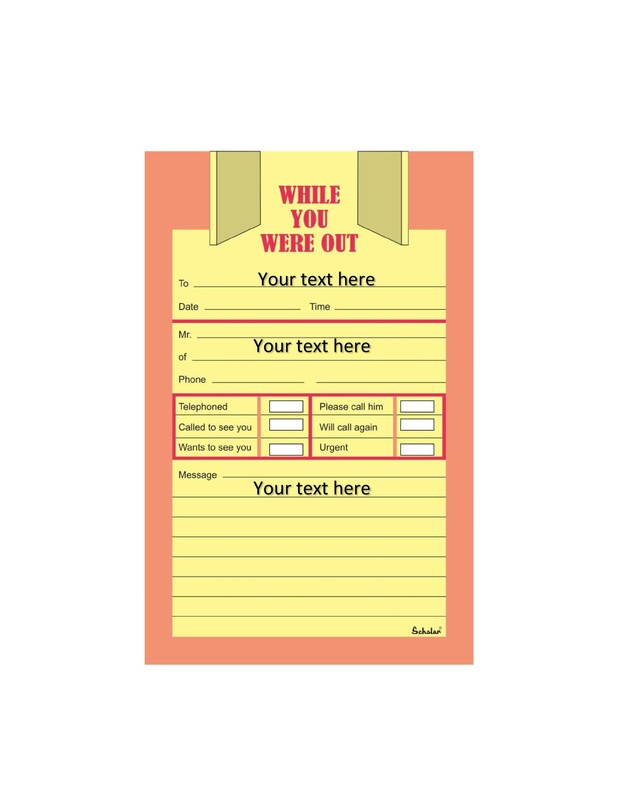 Orient the people in your office or your home regarding how the templates are to be used. Everyone needs to know that what they are for and how they are to be used. 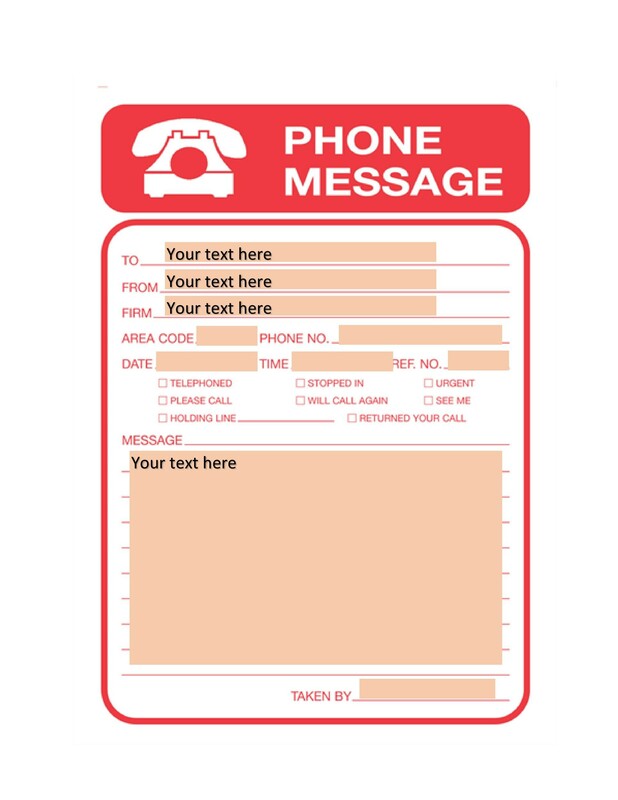 Instead of scribbling messages on random pieces of paper which can get lost or misplaced, writing on the template would be getting the most out of it. 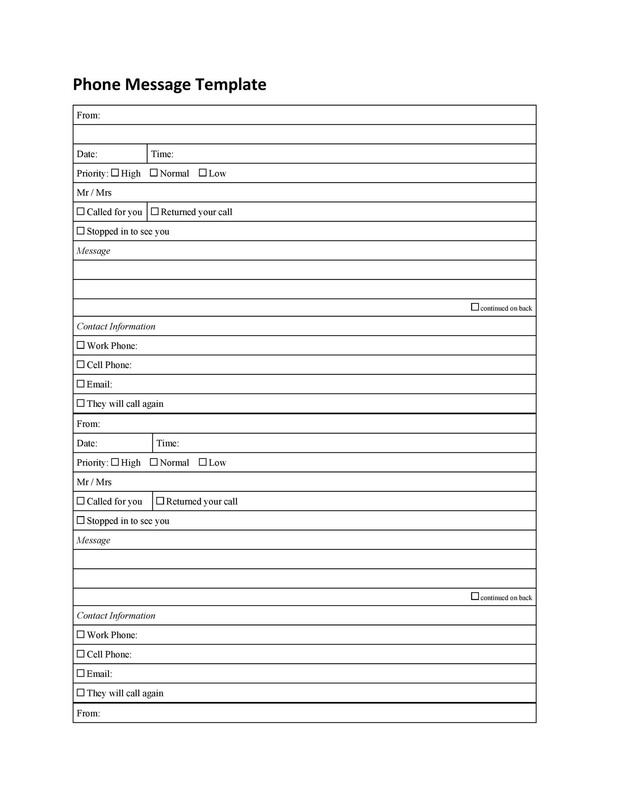 Make sure your template has enough space on it for the receiver of the call to write on. This is especially true for templates made for offices or organizations. A lot of information needs to be included so that the person the call was for will be well informed of all the details of the call. 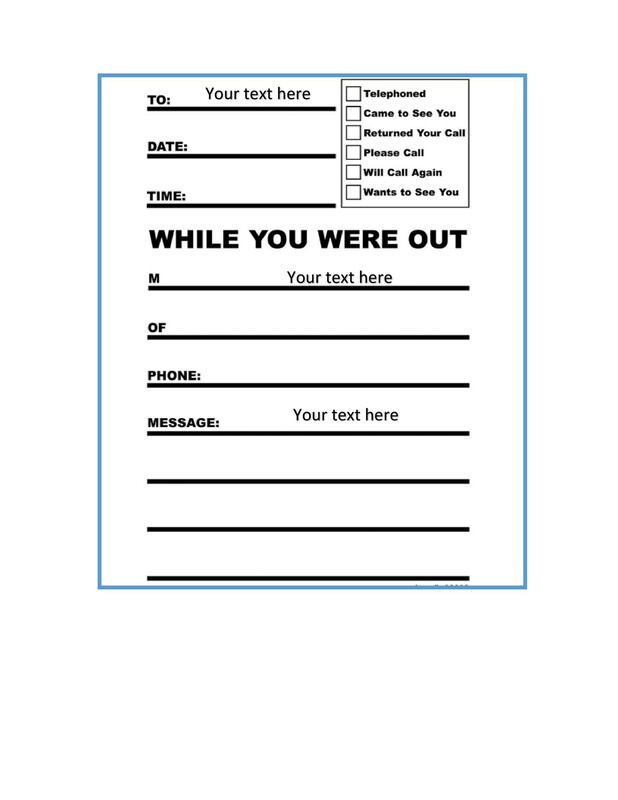 The templates should be placed right next to the office phone, along with a pen which works and a backup. This is so you won’t have to scramble to look for another pen when the one you’re using runs out of ink. To avoid confusion and misunderstandings, make sure that your template is clear and has space for all the relevant details. 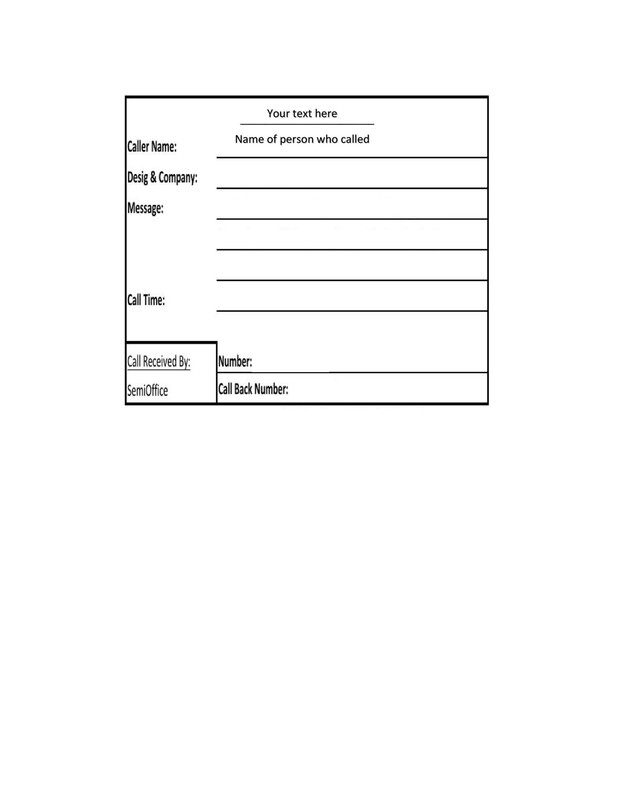 The receiver of the call must be able to write down all the information clearly and use the template as a reference to ask the right questions to the caller. 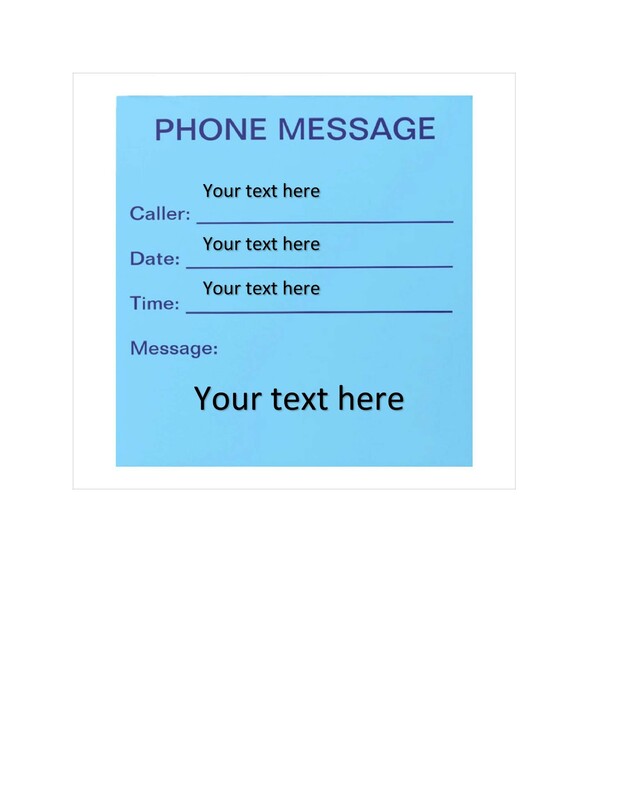 Remember that the date and the time of the call is important so it’s a good idea to place that information at the top of the template. Recording the date and time will help the receiver recall the conversation. Aside from that, recording these details may be important if you need verification for legal purposes. When writing the information, ask for the correct spellings for names. This is so that you are accurate when recording the information. Ask if the call or the message is urgent. 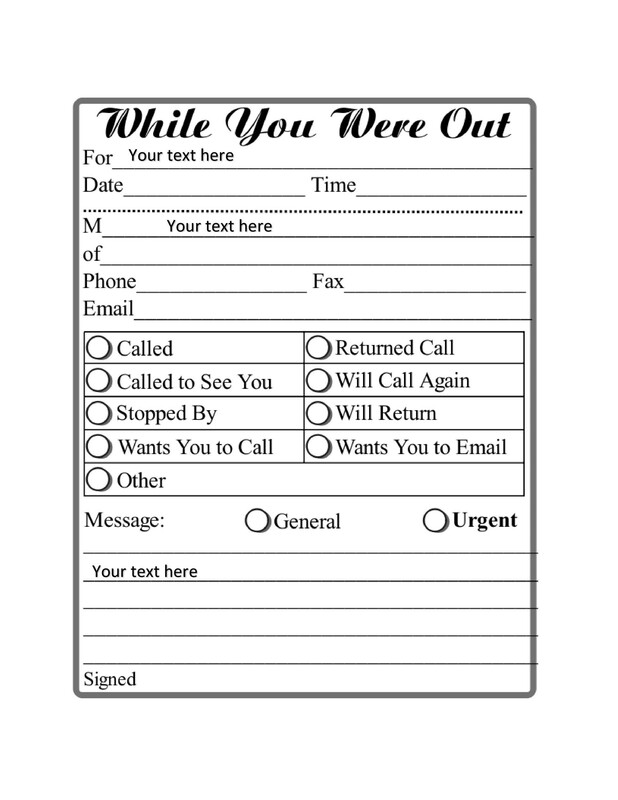 Doing this would allow you to determine whether you really need to find or contact the person the call is for immediately or you can wait for the person to come back. 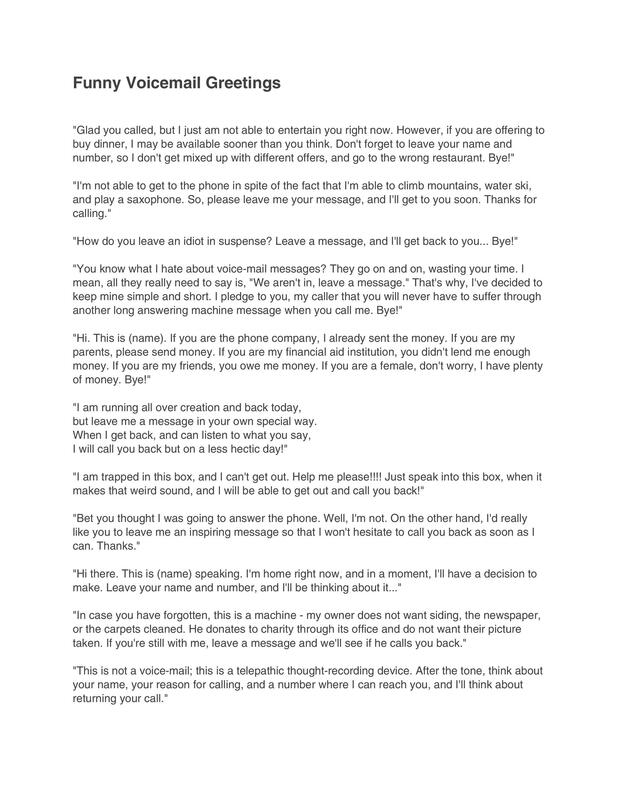 Before hanging up, read the details of your message back to the caller to make sure you didn’t make any mistakes. 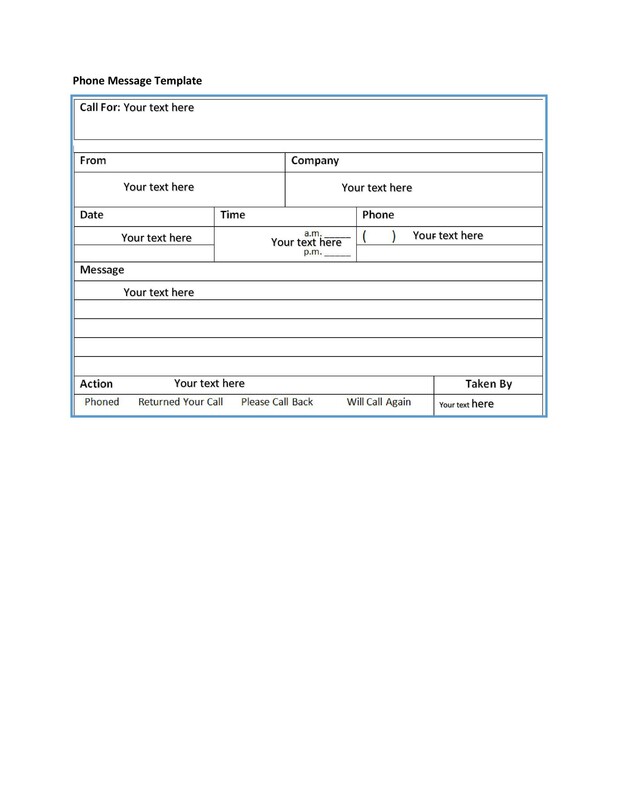 At the bottom of your template, write your name or initials to signify that you had received the call. Doing this would give the person the call was for a chance to ask for clarifications if anything is unclear. Finally, make sure the person the call is for gets the message as soon as possible. Initial the bottom of the message. This way, if clarification is required, you can be contacted directly. Once you’ve taken the message, make sure to put it some place it is sure to be found by the recipient. 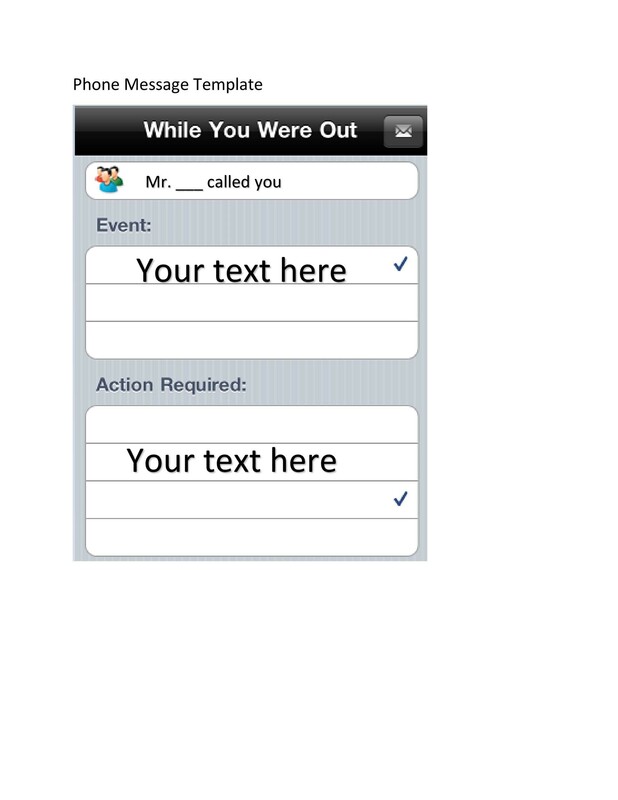 Have a common location for the pickup of message or place it in a location where it will be seen. 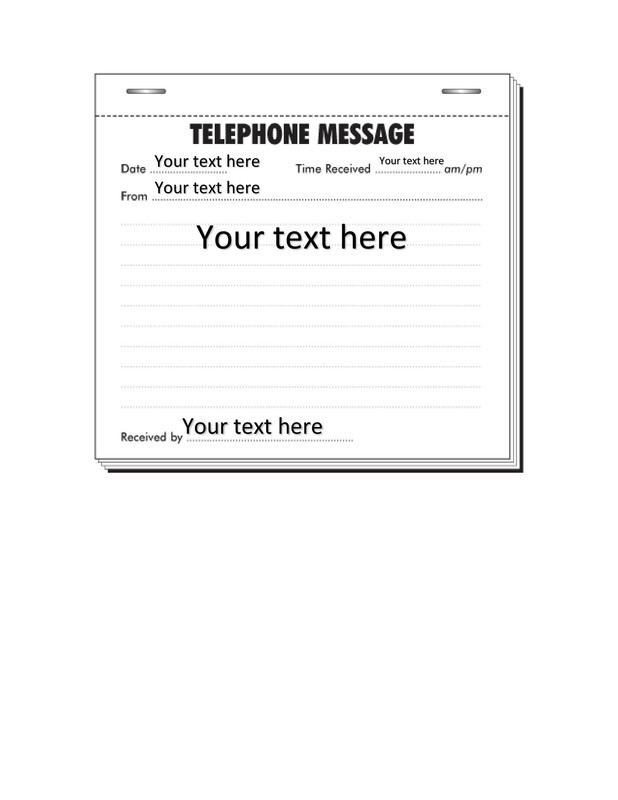 Templates are typically suited for telephones at work. However, you most likely have your own mobile device which your customers and clients will be able to contact you. 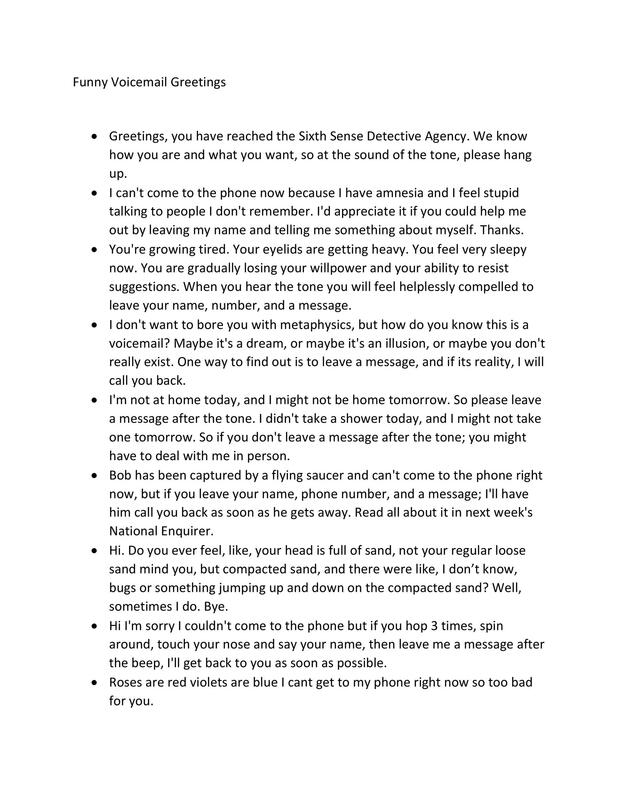 In cases like these, you still might not be able to take the calls, for different reasons. 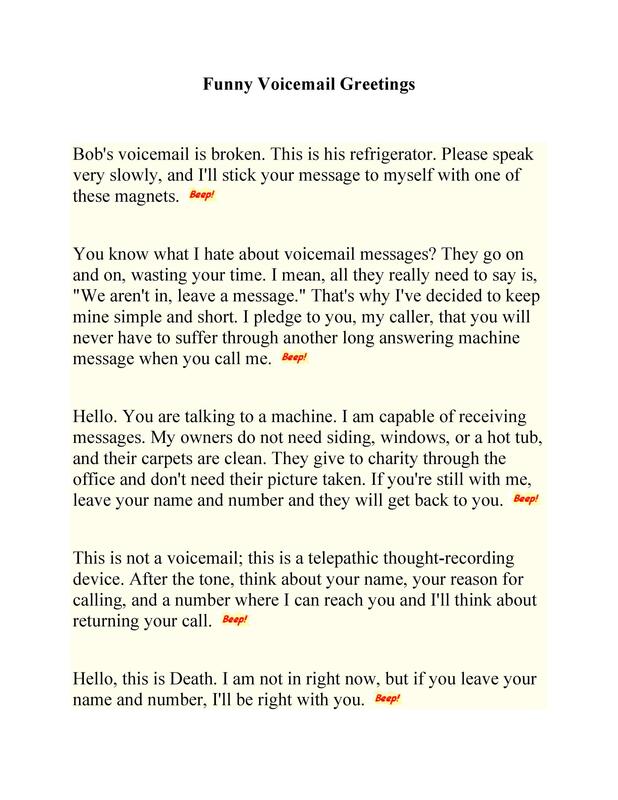 This is where voicemail comes in. This kind of greeting is the default kind which is typically used if no other kind of greeting is set or composed by anyone in the office. This kind of greeting is used for people who will be calling you from within the company. 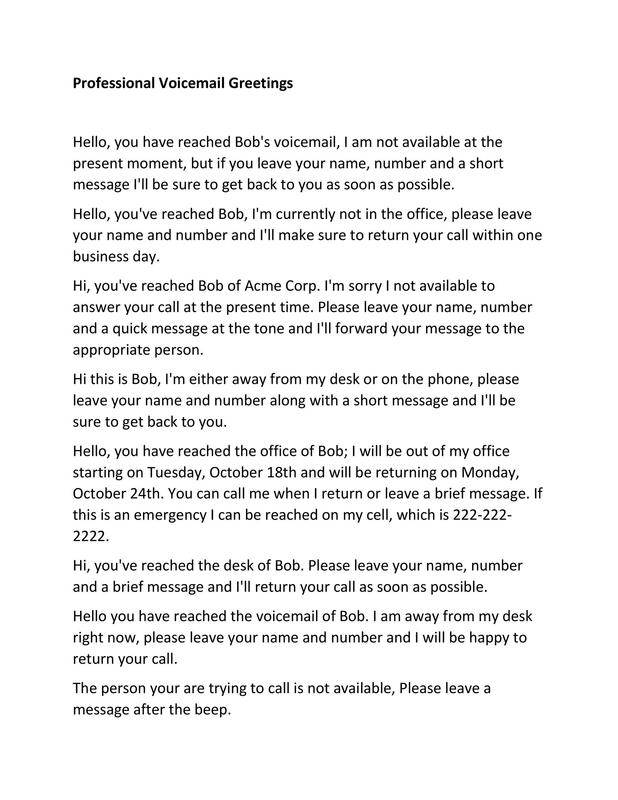 This could be a person from a different department or a different call extension. This kind of greeting is used for people who will be calling you from outside of the company. You can either compose this yourself for your own work phone or a general company greeting will be played for the callers. This kind of greeting can be used if you will be out of your office for a certain amount of time. Usually you can set the start and end dates of the automated greeting so you don’t have to turn it off when you get back. 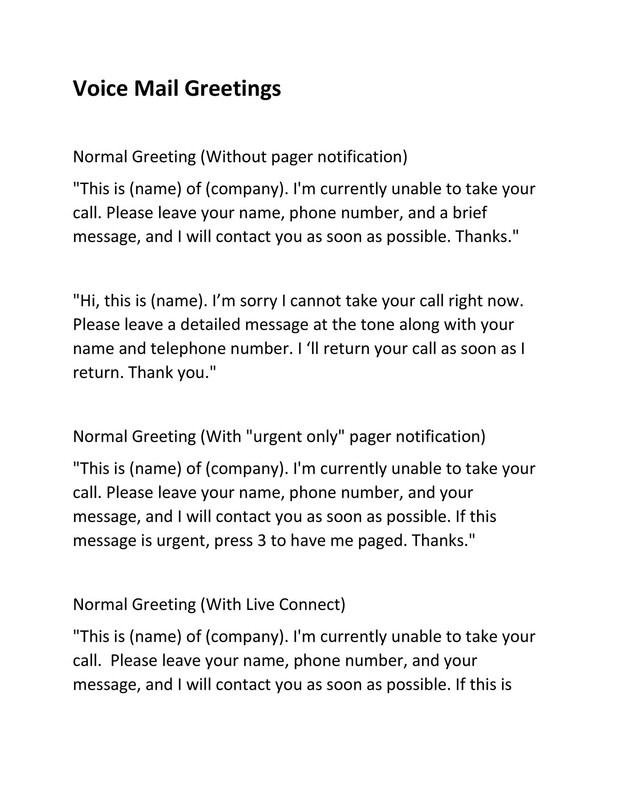 This kind of greeting can be used when you want to inform the callers that you are in the office however you are unable to take their call at that moment, for whatever reason. Depending on company procedures, you may compose your own message or go with the automated messages which are already provided by the company. To help you make a great greeting message, let’s go through the basic elements. Your greeting needs to be short but pleasant. It doesn’t have to be too formal but make sure it’s not too casual either. Make sure to mention your name. Even if the caller already knows who he/she is calling, it’s a good idea to mention your name. 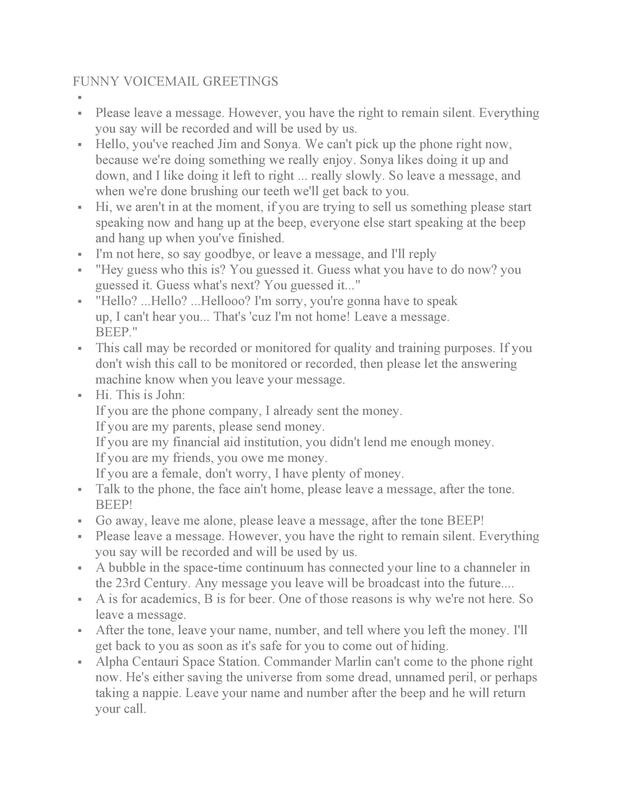 This is in case the caller doesn’t know you and has just been given your number. These are useful information to share so that the caller will know exactly who he/she is calling. Giving the name of your company and department will verify who you are. You can specify the reason why you are unable to take calls or be more general with your statement. Also include an invitation to the caller to leave a short message. This message would be regarding the reason why he/she called you. 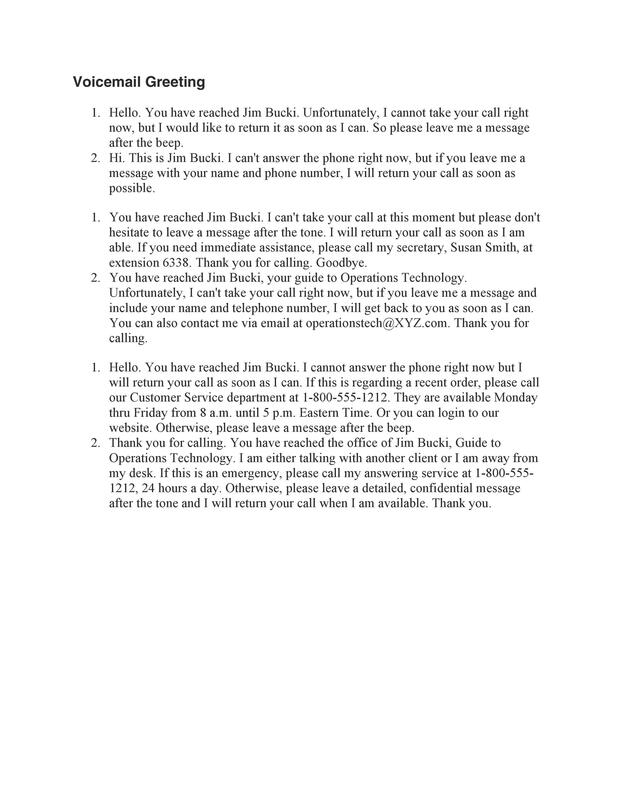 You can also include a statement about when you will be able to make a return call. This may not be as important especially if you notice that your greeting is getting a bit long. If applicable, you can give the name and number of the person the caller can contact in the case where the matter is urgent. 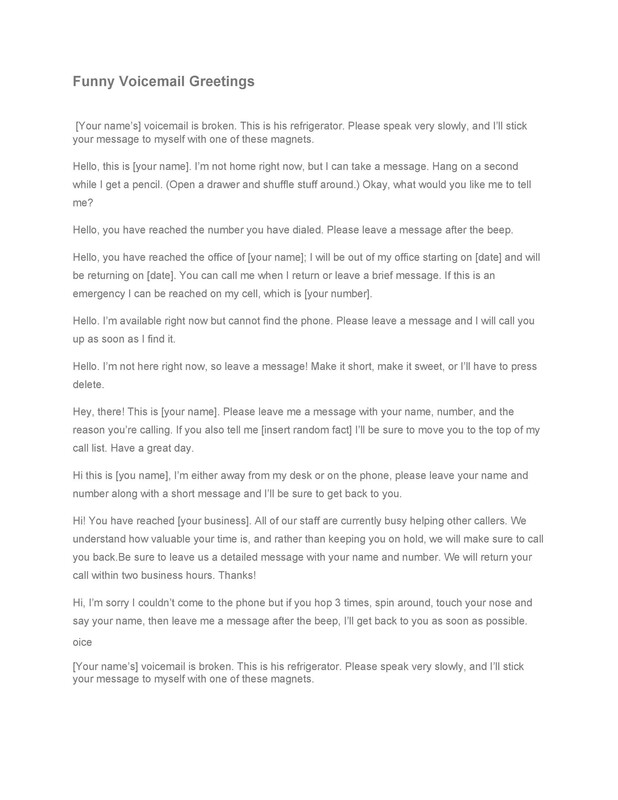 Including all these information on your greeting will make it an efficient one. A good thing to remember is that your greeting should be 20-25 seconds long and not longer than that. Try to avoid making a lengthy message which gives out too much information. Aside from the elements of a greeting, there are also different types which you can compose, which we will be looking into next. Hi, you have reached the office of [mention your name] in [mention the name of your business]. I do apologize but right now I am not available to answer your call. 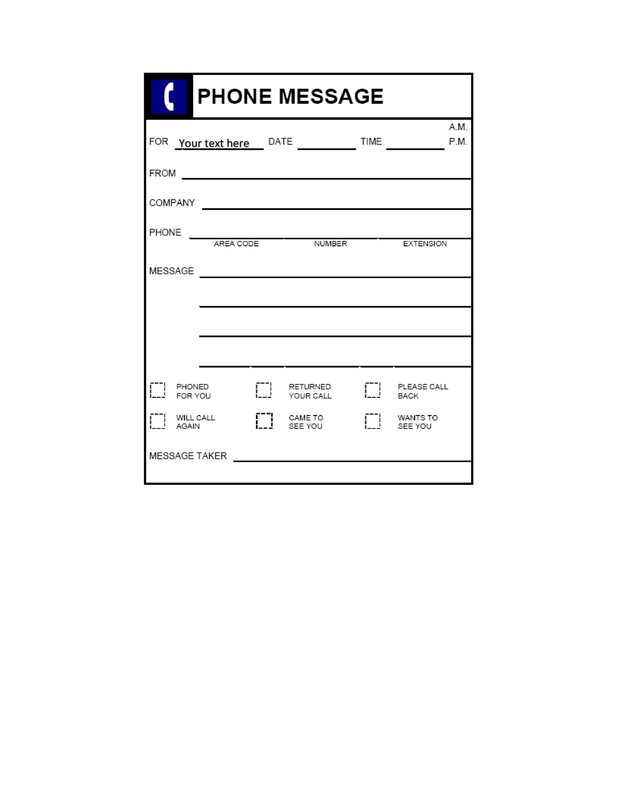 Please leave your name, your contact number and a brief message after the tone. I’ll forward your message to the right person as soon as possible. Hello, this is [mention your name]. I am either on the phone or not at my desk right now. 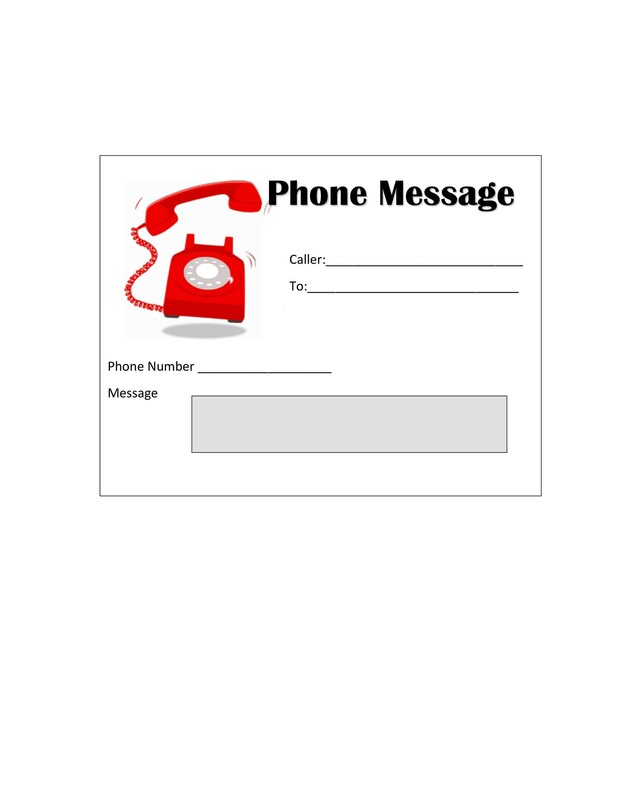 Please leave your name and your contact number along with a brief message. I’ll get back to you as soon as I can. Hi, you have reached the office of [mention your name]. 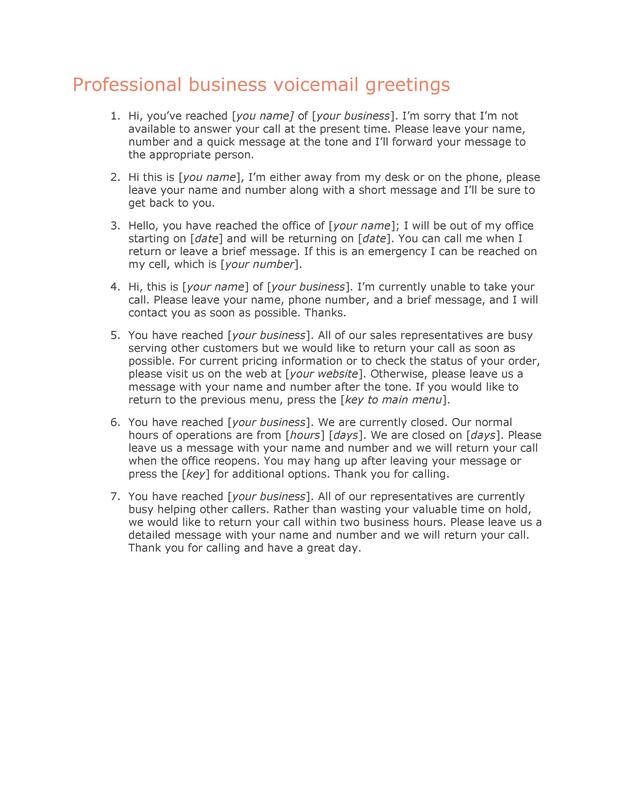 I will not be in the office from [mention your starting date] to [mention your returning date]. You can call me when I come back or leave a short message after the tone. However if it is urgent, you can contact me on my mobile phone, which is [mention your mobile phone number]. You have reached [mention your name] at [mention your business]. 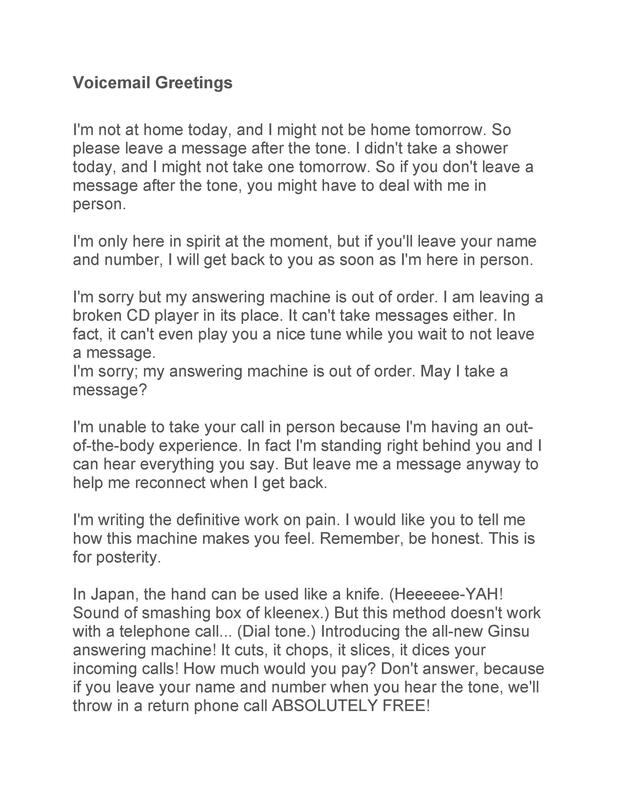 Please leave your name, your contact number and a brief message after the tone. I’ll return your call as soon as possible. You have reached [mention your name] at [mention your business]. 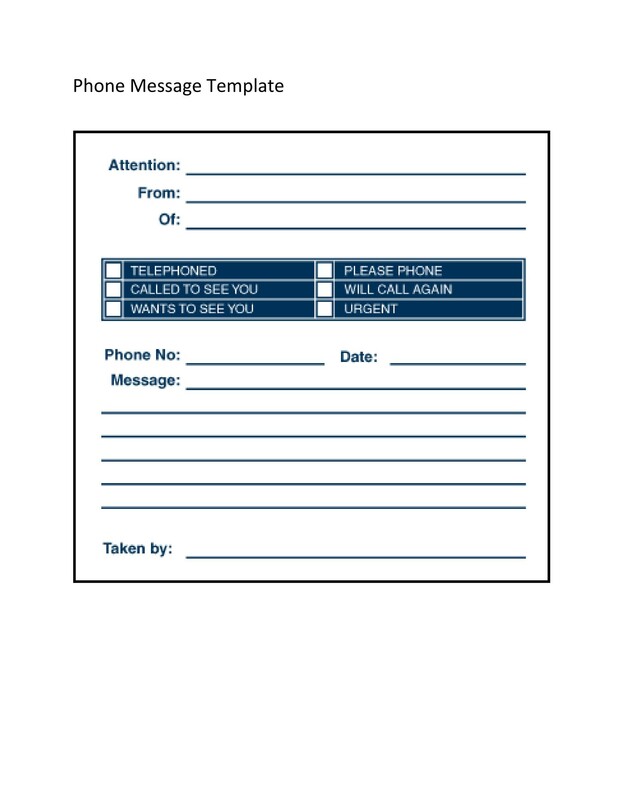 Please leave your name, your contact number and a brief message after the tone. I’ll get back to you as soon as I can. You have reached [mention your name] at [mention your business]. Thank you very much for your call. I’m sorry for the inconvenience but if you leave your name, your contact number and a brief message I’ll call you back. Thank you! You have reached [mention your name]. Thank you for calling, please leave your name, your number and a short message. I’ll get back to you as soon as I put this fire out. You have reached [mention your name]. Thank you for calling, please leave your name, your number and a short message. I’ll get back to you as soon as I can. I would have answered, but I was already on the phone with the President – I swear! You have reached [mention your name]. Thank you for calling, please leave your name, your number, and a short message. However, if you’re [mention the name of your celebrity crush], please call my emergency line. Deciding on the type of message to compose would depend on different factors, but mainly on what is appropriate. There are other things to think about and consider when making such messages. Let’s go through them next. The most important factor to consider is the information in your greeting. Short as it is, you should provide everything that is relevant for your greeting to be effective. Consider the validation. 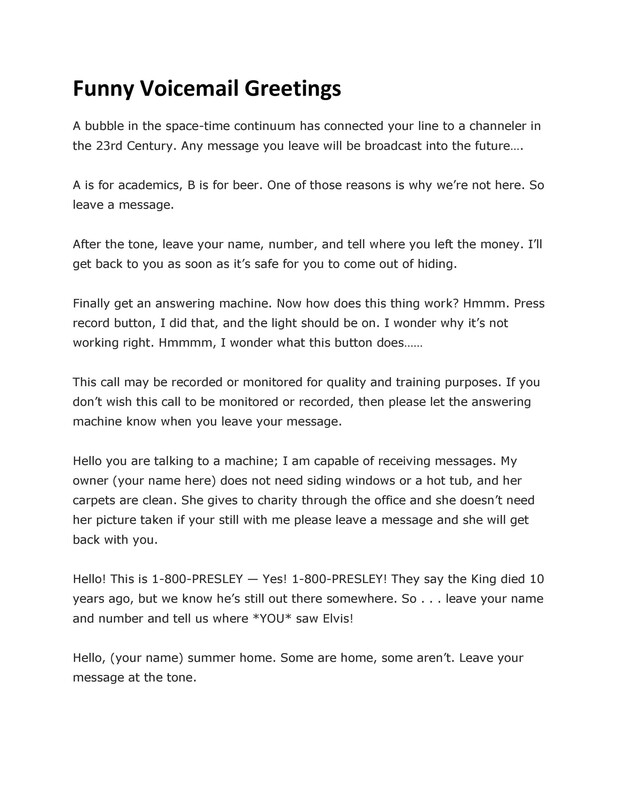 The caller should get 2 important sentiments from your greeting. The first is to thank the caller for taking the time to make the call. And the second is to apologize for missing the call. You must include either one or if possible, use both. It’s important to remember that when someone calls you, it’s because they are interested. 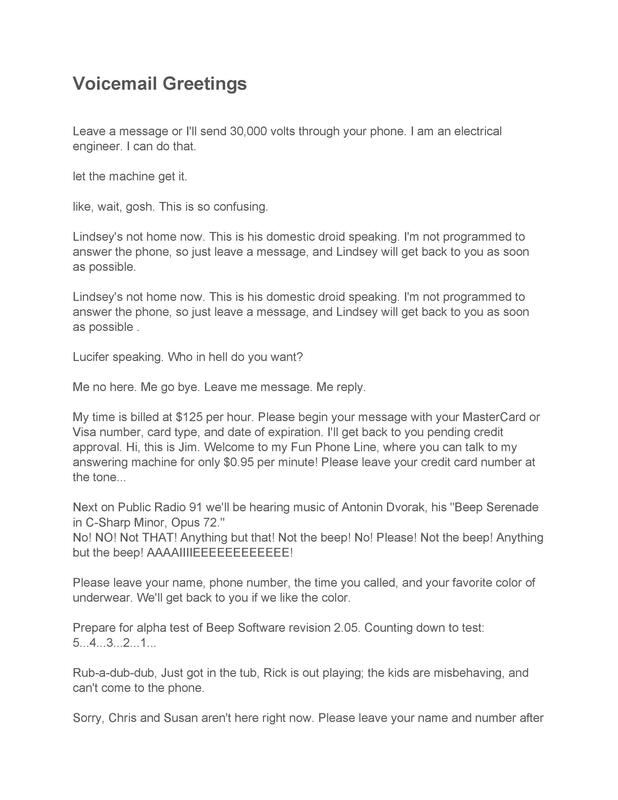 Now if they reach your voicemail, you can potentially win or lose the client. So your greeting should act as a motivating factor to keep the customers and the clients interested. So think about that. Think about how long your greeting is. If it’s too long, you might end up losing the potential customers. They might hang up rather than listen to your whole message. So remember to keep it brief, pleasant and to the point. Usually, a greeting would not exceed 25 seconds for it to be effective.